A 1930's newly converted, first time listing farm workers cottage situated in the grounds of a listed former Rectory, now known as The Grange. It is located at the end of a long (1/4 mile) private tarmac lane. The two bedroom cottage has a bathroom with shower up stairs and also on the ground floor is another wc. Dining room and kitchen with central isle, flat screen TV's with DVD's are in sitting room and kitchen. All rooms have electric panel heaters, the sitting room has a wood burning stove and views across the lane to a paddock and the the gardens of The Grange. Outside is a small garden with deck and large external dining table, also a small garden to the side. Parking is adjacent to the cottage, this is a private road but also a public footpath. In fact at this point footpaths go in four directions with views across to Dartmoor and Chagford which is 17 miles away. Lapford village is on the single track Tarka Line and trains run regularly to Exeter or Barnstaple direction. Buses also go to Exeter and Barnstaple. Kitchen/Diner. Dining table for 4 plus breakfast bar for 2. A deck with a Gazebo. The cottage is really pretty and cosy but spacious. The kitchen is big and we'll equipped, and the lounge is a good size too. Everything we needed was provided, including milk, cheese and biscuits on arrival. Plenty of wood for the wood burner is available, which keeps the lounge toasty. There was a lovely little christmas tree too and decorations, which was fab. The location is down a long track away from the main road so is quiet and secluded with just 2 other cottages nearby. The garden was fenced in so perfect to be able to let our dog out. There is a really good village pub within 15 mins walking distance which was a bonus too. Finally the owners were lovely and very welcoming. Nothing missing at all for us really!! Thank you for spending the time to review your stay in Grange Cottage, it was lovely to read how much you enjoyed your holiday, and what you liked about the Cottage and the area, and that you were able to relax. We very much appreciate your comments, and thank you for choosing Grange Cottage. We hope to welcome you back sometime in the future. Wow , everything was just perfect. Really cosy with the log burner as the weather unfortunately was not perfect ( did not expect it to be in November!) but we still had a lovely relaxing break .Very quiet and peaceful location but a nice local pub nearby. We both had a fantastic sleep as the bed was very comfy and the bed linen was luxurious ! The garden was great for our elderly dog as all in closed, hopefully we will be back so we can enjoy the garden aswell .Thankyou Joanne & John , we enjoyed the lovely cheese & biscuits also Millie enjoyed her treats aswell ! Thank you both so much for taking the time to review your stay in our cottage. We are so pleased you were able to enjoy yourselves despite the weather, and it was lovely to meet Millie to. Beautiful cottage, wonderfully equipped, warm, cosy and yet spacious accommodation. The décor was lovely, the woodburner a great addition, the electric heating was so efficient and the shower really powerful. All the important details that you need in a holiday cottage were here and more. What more can we say, we had a fantastic stay in a beautiful, peaceful cottage, which was also in walking distance of a great Pub! We hope to return to stay again in Grange Cottage and explore yet more of the great walks in the area and check out more of the local hostelries!! Thank you for providing such a great holiday location. This was the best holiday cottage we've ever stayed in. A serenely peaceful setting, surrounded by beautiful countryside. The property was very thoughtfully designed and tastefully decorated, with everything you could possibly want provided, including parking. Joanne and John were very welcoming. Lapford is perfectly placed for exploring all parts of Devon. We would thoroughly recommend both this cottage and its location and would definitely visit again. Fantastic cottage great location perfect for romantic break or family holiday especially with four legged members. Everything you need in the cottage, was really cosy and warm being as the weather was not good so was nice to come back to. Would recommend to friends and family and hope to be back soon. 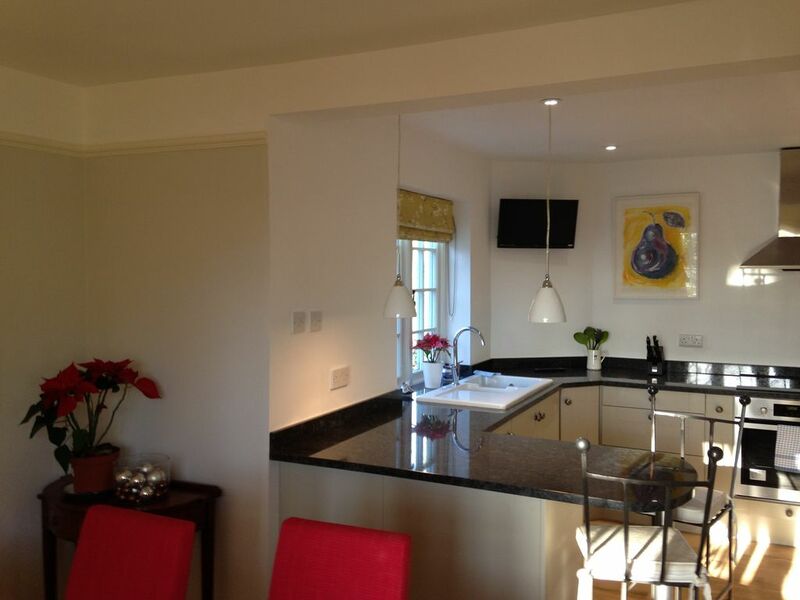 A beautiful cottage in a lovely location, stylishly furnished with quallity fixtures throughout. The owners were friendly and welcoming suggesting a few things of interest in the area. A welcoming gift and card a lovely touch. We would definitely recommend and stay again if in the area.